There used to be a coastal landmark in this spot at 111 Highway 101, Yachats. It was razed on Oct. 8. If they haven’t been to the central coast for a month and go there now, Albany visitors will discover that a landmark, the building housing the former Landmark restaurant in Yachats, has disappeared. The place used to overlook the estuary of the Yachats River and a good slice of the Pacific Ocean. It had been closed since 2010 and was looking increasingly decrepit. 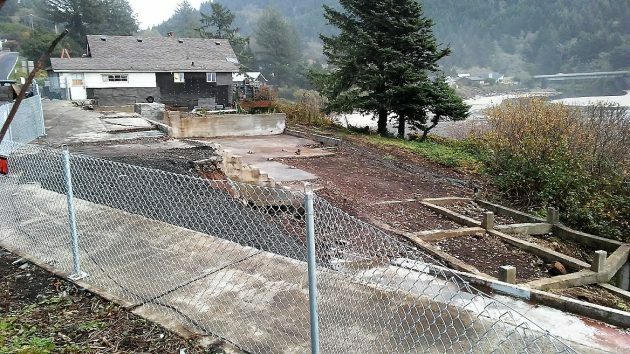 And on Oct. 8, I learned from the monthly newsletter of the city of Yachats, the ramshackle structure was torn down. A pang of sorrow maybe. But unlike in Albany, no landmarks commission to stand in the way. No public hearings on preserving or razing a landmark. And, apparently, no land use litigation as a result. In Oregon, where everything old and the least bit picturesque runs the risk of being labeled “historic,” and especially on the coast, this building might have had a legitimate claim. A restaurant occupied that spot since 1911, “first as a cookhouse for a small band of settlers, then as a tiny cafe sitting beside the dirt road that ended at the river a quarter of a mile south,” the Landmark said on its website when it was still a going concern in 2006. After the coast highway was completed in 1934, Beulah Swigert came down from Portland and took over the place, called it the Sea View, and started making it famous for excellent home cooking. After her death in 1959, new owners expanded the property, by then Beulah’s Sea View Inn and On the Rocks Lounge. The lounge drew big-name entertainers such as, according to the website, the Drifters and the Coasters. It didn’t become the Landmark until 1989. Anyway, this former hot spot on the coast has been dead for eight years. Now the corpse has been cleared away. The site has been cleaned up. It looks like the adjoining structure to the south, a dwelling and a former Lions Club thrift shop, are being fixed up. A carpenter was working on the exterior last week. Beulah’s was one of our favorites ! Chicken and dumplings or chicken fritters with bran muffins with tomato \orange preserves. Excellent food,back in the day. Dinner was about $3.00. Late 1960’s -mid 1970’s. Restaurant building was sound then, but the thrift not so much. Coasties know that time and storm ultimately win out over human desire.. If somebody has financing and a business plan, well maybe there’ll be a successor. My Dad had a wholesale food and ice cream business in Florence in the 50’s. He supplied Beulah with items for her restaurant. She was a friend. When I was about 10 years old, a car did not make the corner on 101 in the middle of the night. It went clear thru Beulah’s and landed in the lower back yard of the property. No one was in the restaurant to be hurt. My Dad and I went up the next morning to visit Beulah and check on his ice cream and frozen food freezers he supplied to his customers. Memories.